1. Start with the basics - work your puppets correctly. Remember puppet height, eye contact with audience, and lip synch. 3. Record your scripts to let new puppeteers concentrate on their puppetry skills. 4. Choose your scripts carefully — scripts need to match your puppets, voices, and skill levels of your team members. 5. When using scripts from other sources, first evaluate the doctrine. Does the script teach Law and Gospel correctly? Does it emphasize what God did for us or what we have to do for God or to come to God? 6. 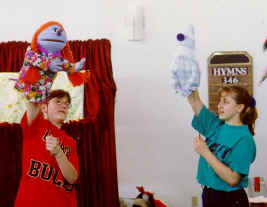 Add variety or length to your performances by adapting Christian songs or Bible stories for performance by your puppets. 7. The volume of your puppeteers needs to communicate to the entire audience. If your team can’t provide the volume, investigate recording the scripts or using micro phones. 8. Add rod-arm techniques and motions to bring your puppets to life. 9. Scenery, costumes, and props enhance your performances. 10. Take good care of your puppets. Use puppet stands to keep valuable puppets off the floor. Purchase large plastic storage containers to keep puppets dry and safe.